Here are some great promotions that Maple River Golf is offering currently. When we say UNLIMITED we mean UNLIMITED! Discover why our course is ranked one of the best in Northern Michigan. Play when ever you want even if it's a holiday. Just give us a call at 231-529-6574 (option 2) for your tee time, and you are all set. Golf Cart is also included. Play Footgolf anytime. Bring your own soccer ball or just use one of ours at no cost. Have a Small Group of Friends? Up to 9 members. Includes UNLIMITED Golf with a cart and UNLIMITED Footgolf with a soccer ball. All Season Long. $2,800 total for all members.Not all members have to play together in order to receive the group rate. Play on your own if you want. For example: If you have 9 people in your group that's $311.11 per person. Now that's a deal! 10-19 members. Includes UNLIMITED Golf with a cart and UNLIMITED Footgolf with a soccer ball. All Season Long. $4,200 total for all members. Not all members have to play together in order to receive the group rate. Play on your own if you want. For Example: If you have 16 people in your group that's $262.50 per person. Now that's a really good deal! 20-29 members. 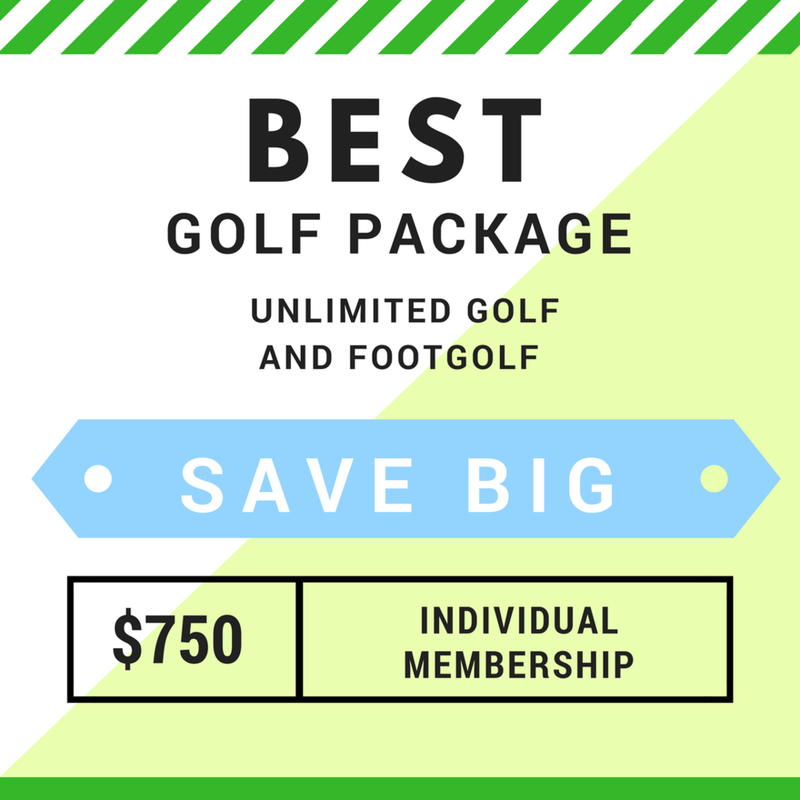 Includes UNLIMITED Golf with a cart and UNLIMITED Footgolf with a soccer ball. All Season Long. $6,300 total for all members. Not all members have to play together in order to receive the group rate. Play on your own if you want. For Example: If you have 28 people in your group that's $225 per person. Now that's a really really good deal!